Lock in a great price for Silken Río Santander – rated 8.4 by recent guests! Amazing location and property close to the beach and parks and attractions! Amazing for strollers and joggers! Beautiful location! Had a view of the beach! Walking distance to restaurants. Get the included breakfast at a good value! We would certainly come back , the view was magical . The room and bed was very comfortable . The staff were pleasant. Loved the location! Beach directly across the street with restaurants that have enormous windows for watching the water! Be careful, this hotel is located on the OTHER side of Santander so it's a bit of a walk / trek to the main town. If the weather is beautiful, then great, otherwise you are a bit far from restaurants. As I was travelling on my own, I stayed in a "full size" bedded room. This was perfect for one person. My room was situated at the back of the hotel, so very quiet. The room was very well insulated, between floors & between rooms. The only noise to be heard was out in the hall. The food served for breakfast was always fresh and the coffee machine made wonderful espressos! Silken Río Santander This rating is a reflection of how the property compares to the industry standard when it comes to price, facilities and services available. It's based on a self-evaluation by the property. Use this rating to help choose your stay! One of our top picks in Santander.Next to Santander’s famous Sardinero Beach, this modern hotel offers wonderful views of the Cantabrian Sea. Free Wi-Fi, a minibar and satellite TV are included in each stylish room. 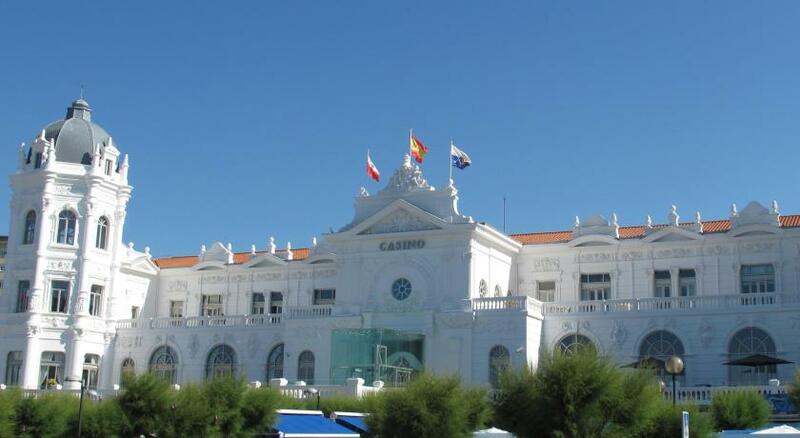 The Silken Rio Santander is located near the city’s Gran Casino. Santander Cathedral and the ferry port are 2 miles away. Regular buses to the center of the city stop near the hotel. The restaurant Mare Alta serves creative modern cuisine and has sea views. The Marea Baja café-bar is open all day, and has a range of light snacks. The rooms at the Silken Rio have simple, elegant décor and dark wood furniture. They include air conditioning and a private bathroom with a hairdryer. When would you like to stay at Silken Río Santander? Private parking is available at a location nearby (reservation is not possible) and costs EUR 16 per day. These spacious rooms have wonderful views of the sea. Some rooms feature a private balcony. Fitted with hardwood floors, they have free Wi-Fi, a minibar and satellite TV. These bright rooms have classic, elegant décor. They have free Wi-Fi, a free safe, a minibar, desk, a TV, air conditioning and heating. This family room consists of 2 connecting rooms, one with views of the Cantabrian Sea and one deluxe room. It has a minibar, sitting area and air conditioning. This double room is smaller and has free WiFi, a flat-screen satellite TV, a mini-bar and a safe. The marble bathroom has a magnifying mirror, a shower, a professional hairdryer and green tea toiletries. The room has independent air conditioning and heating. Room service is available. This room has a 1.35 x 6.6 feet double bed. This family room features a view, satellite TV and air conditioning. Behind its noble façade, the Silken Rio Santander houses impeccable facilities, with 89 rooms equipped with every comfort required by guests today, as well as six function rooms perfect for all kinds of events, and a free Wi-Fi connection. House Rules Silken Río Santander takes special requests – add in the next step! Silken Río Santander accepts these cards and reserves the right to temporarily hold an amount prior to arrival. We could not adjust the heating and it was far too hot in the bedroom. It is convenient as we arrived on the ferry, and were travelling on to our home in Sax. One light switch button was broken for the bathroom and kept falling off the wall. Not a big deal though really. There was a small stain around the bath tub's drain hole. Also not a big deal. I love the foot bath. We got a late check out for free. Everything was up to standards, very happy with my stay. Reception Desk a bit too small/old fashioned. Room dark with insufficient lighting to carry out normal activities. Bathroom smelt of drains. Unable to regulate temperature in room, reception said the hotel is centrally heated/cooled so although there is a temp controller in the room - it doesn't work ! Parking is a major problem, you just have to take your chances of finding a space on the streets in the area. Not a lot - the hotel did not meet what I would have expected from the Silken Hotel chain. They gave us an upgrade. We decided to stay an extra night and the let us keep the upgrade.The view was of the beach. A nice little strip of restaurants were around the corner. Best hamburger ever. I chose the Japanese style one with wasabi. Yum. Beautiful long walk along the beachfront and a quick bus ride back. Perfect location. Astonishing view from my room. Loved the room which was quiet even though it was facing the sea. It was windy, but we did not hear the crushing waves nor the traffic from the road in front of the hotel. Loved the warm towel after my shower. Comfy beds. In the evening, we visited a couple of bodegas where we had some lovely Rioja and Verdejo with some free tapas. Lovely evening near the hotel which bring right in the beach is in a great setting. This is our third and not our last stay. Can recommend!